The Stanislaus River valley is now bridged. Basswood was used to build the various pieces of the bridge. Seen from the south end, the curved trestle is apparent. This was not in the prototype but was necessary in my model so as to fit in the allowed space. One project which I have been wanting to accomplish but kept putting off was the long bridge over the Stanislaus River just outside of Oakdale. I had made allowances for the bridge to be almost scale length which worked out to be about 8 actual feet long, obviously a laborious task. I finally decided to do it. 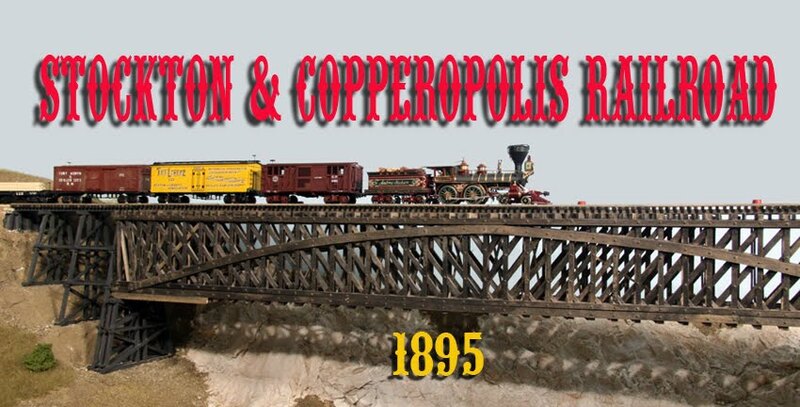 The bridge is made up of two Howe truss bridges, each 140 feet long plus long trestle approaches on either end of the bridge. Fortunately, I have a period drawing showing the basic dimensions of the bridges plus the heights of the various trestle bents. Three period pictures also exist. The details of this work is in my blog of October 28, 2014. To erect the bridge was a bit more problematic. Short pieces of rail were soldered across the rails to keep them in gauge during the next steps of the process. I then cut the plywood pieces of subroadbed which left the flex track hanging in the air. 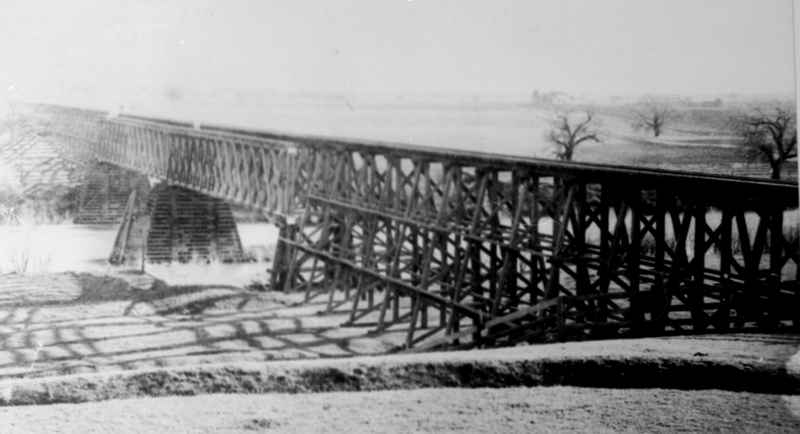 The ties were removed and the bents, now assembled with stringers and ties, were inserted beneath the rails. 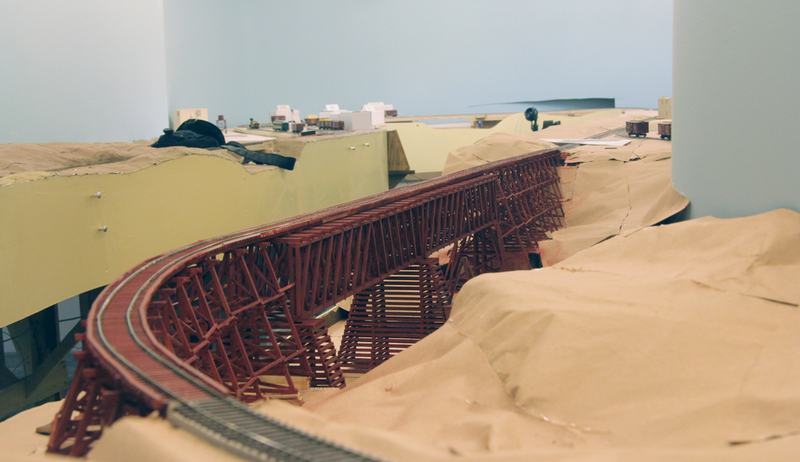 Similarly, the two truss bridges and piers were also put in place. I had allowed for some slop between the bents and the wood supports in the benchwork. Wood shims were inserted to accurately level and the bridge. Before the assembly, the bottoms of the rails were coated with Barge cement which was allowed to dry. After the bridge assembly was in place, a small iron heated the rail, melting the cement and allowing the rail to bond with the bridge. The upstream side of the center bridge pier. The gap between this part and the plywood will be filled with river bed before the water surface is installed. One of the features of this bridge is that the upstream side of the center pier has a tapered section whose purpose is to deflect brush and timber from lodging in the pier. 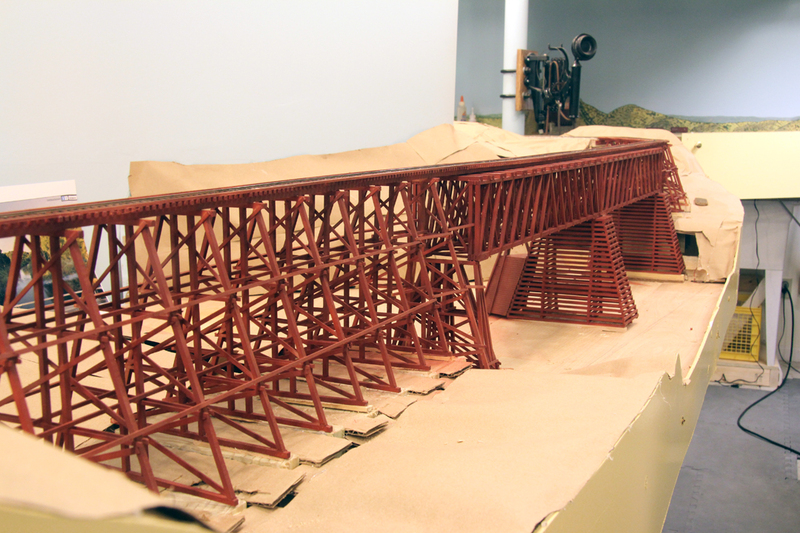 This was present in the prototype bridge so I added it into the model. 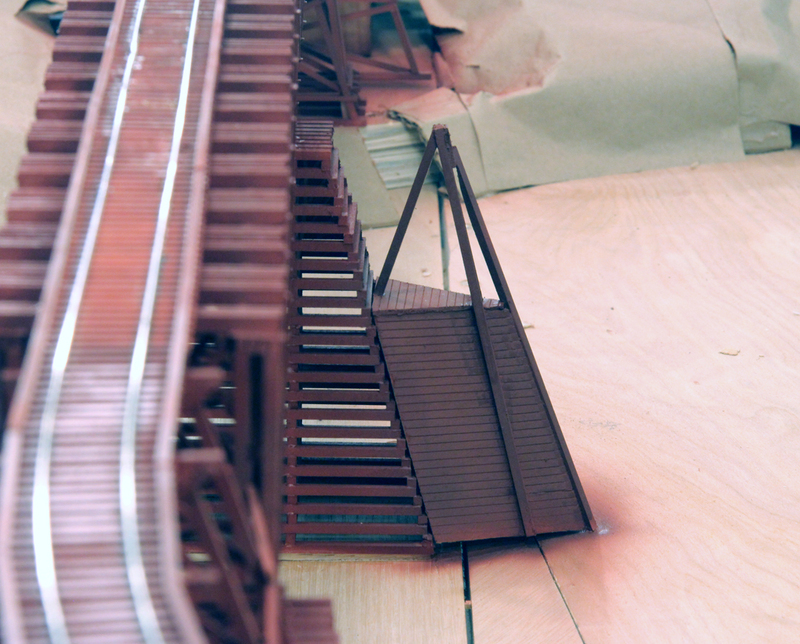 The prototype also had some water barrels on the bridge. The Grandt Line barrels are about the right side so those will be used. Before I can finish the scenery in this area, though, the "Elevated Drive-Way" (as an old post card is titled) must be built.